Still on an organizing "kick," let me show you how I've assembled all of those teeny packages of adhesive gems so I can find just the right size and color when I need it. That's right -- at right -- I've put them in an inexpensive photo album. 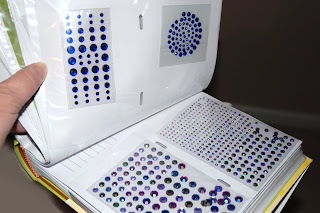 Like all of my other colors I've organized, my adhesive gems ("pearls, rhinestones and diamonds") are sorted in ROYGBV order and put into the photo sleeve. 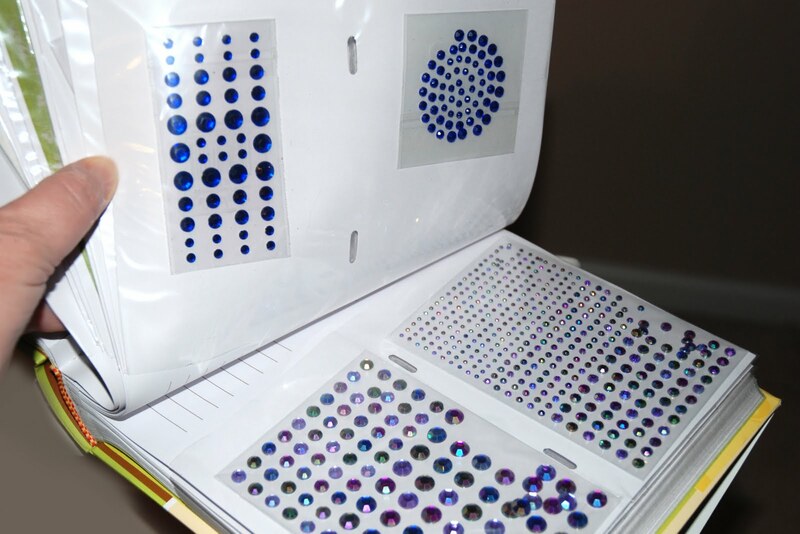 That way, I can easily flip through the album and even leave that page open when I'm working on a project to see what embellishment might work best. This system greatly improves the way I used to manage these little packages. I had them stored in a large envelope in my embellishment drawer; any time I needed to find the right one, I had to dump the envelope and pick through. What a waste of time! Incidentally, the album was on sale at Michael's for $5.00 and I bought it when I had a 20% off coupon for the entire purchase including sale items. $4.00 -- well worth the price of time, don't you think? I've been reading your "Getting Organized" updates and I'm getting seriously jealous. I would love to have everything in place. Any chance you live close to UT and want to play in someone else's stash for a while? :) I've printed some of them off and taken them home to show DH and he just laughs at me knowing that if I actually gave everything a home it would last about two seconds. He calls me the "Pigpen" of crafters. Great idea! I do not think of these things by myself, haha! What a fabulous idea!! I will be doing that with mine too. They are currently in a ziplock bag and I have to dump them all to find what I need too. Thanks for sharing. I saw this and thought wow. I will be using this idea. Thanks for sharing. I love this idea! I'm in the process of getting organized in our new home so new tips are wonderful. Thank you so much!! Love your idea on how to store your gems. I will have to do this. This is pretty darn brilliant. I actually have a couple of unused albums that I'm stealing this idea for.